We just don't fix your problem, we have a proprietary 39 point checklist system that finds all of the underlying problems of your operating system. 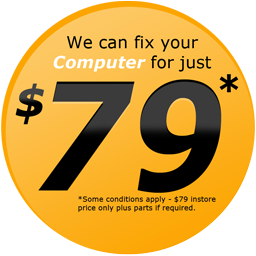 This will service, tune and optimise your PC computer system or notebook, so that when we return it to you, it will operate like brand new. Computer networking is defined as having two or more computers connected to each other. Thus, a network or computer networks are a collection of PCs that have the capability to share information between multiple systems. These networking computers are linked through telephone wires, cables, satellite links, and wireless transmissions (wireless computer network). Computers can be connected to networks in various ways—from basic Internet connection between rooms in the house, to more sophisticated business networks across countries. Whether for home or business use, we offer computer network support and have expertise in all facets of computer networking like computer network installation, computer network maintenance, and computer network security. If your computers are not talking to each other, you need fast on-site service. Next time your computer network is down, give us a call and we’ll resolve your network problem. Want to install a computer network but not sure where to start? Our skilled computer network support team will work with you to evaluate your computer networking requirements and provide a suitable solution. But before any work is carried out, we will first discuss what your options are. Aside from providing efficient computer network services, we also guarantee the security and protection of your documents, emails and programs. Once your computer network is up and running, we can also provide computer networking training and an aftercare service to further support you and your business.